What better way to explore the Aysen region of Chile, then Chalten & the infamous Perito Moreno glacier in Argentina and then finally cycle across Tierra del Fuego - the island at the end of the world. You'll have a day in Buenos Aires at the end to bask in the glory of your 709 mile adventure through Patagonia. Travel from your location to Buenos Aires. Make sure your bike arrives! Free time in the city. Flight Buenos Aires - Comodoro Ribadavia. Van transfer from Comodoro (Arg) to Chile Chico (Chile). The trip takes 5 hours (486 km/ 302 mi). We start our journey towards the Carretera Austral, on a dirt road with very little traffic and spectacular landscapes, along Lake General Carrera - the largest lake in Chile and the second largest in South America. The lake extends into Argentina, where it's called Lake Buenos Aires. We leave behind Puerto Guadal and ride towards the South, to Cochrane, the capital of the province of Capit?n Prat, a village of 3000 inhabitants that presents itself as the main centre of services in the region of Ays?n (Banking, ATM, Hotels, and Restaurants). Going deep in Patagonia. We detour from Carretera Austral and go west to Caleta Tortel, 103 km/ 64 mi from Cochrane, by a road built only in 2003. From Tortel we have to backtrack 20 km/ 12.42 mi to resume Carretera Austral, direction south. We then arrive to Puerto Yungay (optional van ride till this point) where we will cross a fjord on a barge (45 min), which leads us to the last section of the Carretera, opened in 2000. From the South bank (Rio Bravo) we still have 100 km/ 62 mi of wildlife until we reach O'Higgins. .
We get up early and cycle a 7km/4.3 mi path along the river Mosco and cross and then follow the river Mayer until we reach Bahamondez Bay. We will cross Mayer river by the bridge Augusto Grosse (123 m/ 403 ft) and a 500 m/ 1640ft pass way. From here we can see where rivers Mosco and Mayer meet and the summits that surround O'Higgins. We will then navigate in a fiord for a couple of hours to arrive to Candelario Mancilla remote farm, where we will stay. Optional extra navigation to visit O'higgins Glacier. Rest day. Spectacular day crossing the border from Chile to Argentina in a pristine area where only pedestrians or bikers can can be found (and horse riders!). Another navigation, in Laguna Desierto, will lead us to the south shore from where we can cycle viewing Fitz Roy peak in a distance until arrive to El Chalten. Van Transfer from El Chalten to El Calafate (280 km/174 mi). Lodging: El Calafate, hosteria. Visit the spectacular Glaciar Perito Moreno (160 km/99 mi return van trip). Van transfer from El Calafate to Punta Arenas (Chile), on the Magellan Straight shore (605 km/ 376 mi). Optional detour to visit the Torres del Paine National Park. Stop on the way (Puerto Natales). We will cross the Magellan Straight by ferry to Porvenir-Tierra del Fuego. Today we have the option to cycle from Porvenir to Onaisin or to Cameron (108 or 155km/ 64 or 96.3 mi). Ride through the wild steppes of Tierra del Fuego, accompanied by guanacos, flamingos and... the famous Patagonia winds. The scenery changes as we move South-East bound. We will cross the border and enter Argentina. As we move southwest the landscape changes. Back to Tierra del Fuego inland, this time in Argentinean Patagonia. This is a rolling day if the weather conditions allow it. The stage leads us to the shores of Lake Yehuin (45 km/ 27 mi). Relax and enjoy the beautiful nature of the lake's banks. Keep up a few more miles, to the shores of Lake Fagnano. This part is mostly on paved road, but is not less interesting because of that. We cross the extreme south of the mountain range (optional van ride). 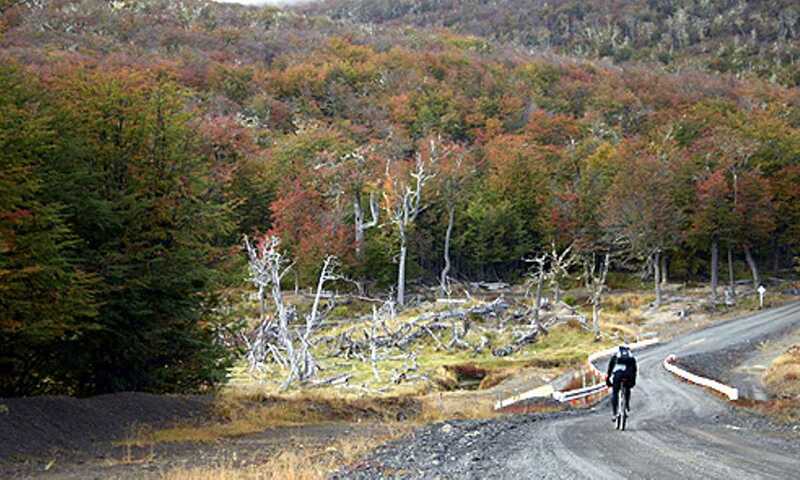 We do the only mountain pass of all Tierra del Fuego Traverse, which is not difficult, and then cycle down to the Pacific coast (Beagle Channel) where Ushuaia is located. Free day in Ushuaia - or reserved day for any unexpected delays - city of the end of the world, where there are all kinds of shops. Possible excursions into the National Park of Tierra del Fuego, sailboat or catamaran trip in the Beagle Channel to see sea lions and penguins, or visit the Estancia Haberton, founded in 1886 by Thomas Bridges, first settler in Argentinean Tierra del Fuego. Free morning in Ushuaia. Internal Flight Ushuaia-Buenos Aires. Transfer to the hotel. Dinner in downtown Buenos Aires (not included). In Buenos Aires, with the opportunity to attend one of the famous tango milongas or celebrate the intense nightlife of the Argentinean capital. Free time to visit Buenos Aires. Transfer from hotel to international airport. International flight. This trip can run as a group trip, with prices starting from $2,585 per person for a complete group. If you are looking to join a group or you are a solo traveller we will help to form likeminded groups of travellers. Please let us know your travel plans. Price from USD $2,585 per person, based on a group of 3-4 people. Supplements apply to smaller groups.